Mobile Apps: What’s A Good Retention Rate? Editor's Note: This article was originally published in March of 2016, but has been updated with the latest mobile app retention data as of March 22, 2018. Let’s face it, as mobile app marketers, we’re going through some growing pains. The rapid evolution of the mobile industry has led to some missteps in communicating with our users, and as a result, we’re losing them. In fact, we’re in the middle of a mobile engagement crisis. Consequently, on its path to becoming our knight in shining armor, mobile must break the mold of being a fling, and it’s up to us marketers to champion this change. How do we do this? By turning our focus to retention (more so than acquisition) and earning loyal (not one-time) users. If you’ve been in the app space for a few years, you know that acquisition was once considered the most important mobile metric. Mobile app marketers focused on attracting as many new users to the app as possible, touting number of users as the strongest pillar of success. However, what people didn’t take into account is the fickleness of these users, with 21% of them only using an app once. It’s now apparent that we must move beyond just measuring app installs and focus on in-app behavior to promote engagement and retention. But despite this revelation, too many brands have yet to shift their focus away from acquisition towards retention. As we make this shift towards retention, you may be wondering, “What is a good retention rate? What are my peers and competitors seeing across their industry and throughout mobile as a whole?” We’ve outlined where retention rates stand today so that you know where you stack up and can benchmark against industry trends to improve. Retention Rate Benchmarks: Where Do You Stand? Another thing to note is that we talk about retention over the span of 90 days or one quarter. This is the industry standard for measuring retention because it takes the app user lifecycle into account. By the way, this 90 day time period is also what our very own data experts at Localytics use when they analyze benchmarks. Now that we have context, here is the answer to, “What’s a good retention rate?”. At the beginning of 2018, we dug through our 2017 data and found that across all industries, the average mobile app retention rate was 29% after 90 days. Yes, you read that correctly. Across all industries, 71% of all app users churn within 90 days. If we take a deeper dive and look at retention averages by industry, it doesn’t get much better. In fact, over the past quarter, it actually got worse. The graph below showcases the average retention rate by industry after 30, 60, and 90 days respectively. As you can see, the average retention rate varies by industry. Currently, Travel & Lifestyle apps retain the most users on average, with a 29% retention rate within 90 days. What does this mean for the future of app retention? We still have a lot of work to do. With the rise of rich push and location-based marketing capabilities, mobile app marketers have a slew of engaging tools at their finger tips. So why aren't more using them? 1.) App Onboarding: If users don't clearly understand the value of your app and how to use it, their odds of churning drastically increase. We've seen app user retention rates increase by 50% after implementing a solid onboarding. What does good app onboarding look like? Check this out. 2. ) In-App Messaging: In-app messages are received while a user is within your app, and is usually based off of some action taken. Because of this, they're highly relevant to the end user and also make it easier for them to move through your app experience. Plus, they've been known to drive retention up over 3x. If you're looking for in-app messaging inspiration, here you go. 2.) Push Notifications - Rich Push & Geopush: Push notifications are crucial to engaging with users outside of you app. But because they're sent right to a user's homescreen, the stakes are high to do it right. That means having compelling messaging that is personalized to the user, and combining that with the latest and greatest in push notification technology: Rich Push & Geopush. 3. ) Individualization: App users crave individualization.They want their interactions to be tailored to their preferences, location, and in-app behavior. In fact, a recent study our data team did found that individualized push & in-app messages performed much better than broadcast. Here are 5 easy ways to individualize your mobile messaging. 4.) Predictive Insights: Understanding which users are at risk of churning gives you the opportunity to save them. Using predictive app marketing, you can design highly personalized messaging campaigns to re-engage these users before it’s too late. 5.) Remarketing: 50% of all app users opt-out of push messaging, making it increasingly hard to draw users back into your app. The solution? Remarketing. Sending a compelling reminder about your app to lapsed users outside of the app is an effective way to re-engage them. You can do this through email, social, and search advertisements. Be sure to tap into data insights about your lapsed app users’ behaviors, interests, and preferences to ensure your remarketing ad is relevant and thus, effective. 6.) A/B Testing: The only true way to know which marketing strategies are working and which are falling flat is through A/B testing. A/B testing makes you smarter and more efficient when it comes to your campaigns, and helps you to pinpoint the messaging and features driving engagement and conversion. For example, you should A/B test CTAs to see which entice users to move through your key app funnels as well as different push and in-app offers to see which are drive higher conversion rates. The more in-app activity and conversion actions a user has, the more sticky your app becomes to them. Looking to get started with A/B testing? Here are 5 easy A/B tests all mobile app marketers need to run. 7.) 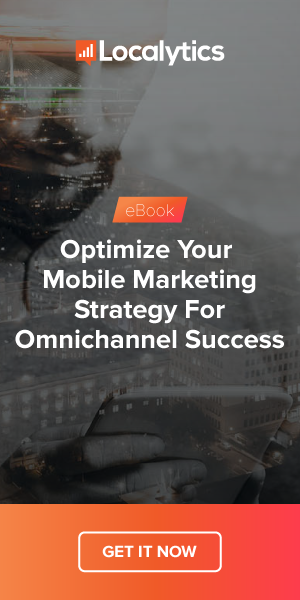 Omni-channel Experience: One of the biggest mistakes marketers make is not integrating their app into their overall marketing channels. Too often, apps are siloed from the rest of the marketing strategy, resulting in a disconnected brand experience for the user. Instead, promote and infuse your app across all other channels to create a seamless experience for users. This seamless experience will translate into having a very sticky app, boosting your retention. Here’s everything you need to do to accomplish this and achieve an integrated app marketing strategy. 8.) Use Data to Guide You: As with any channel, in order to truly win at mobile you need to lead with data. That means having a mobile engagement platform that grants you the insights you need to understand how well you are retaining users, and how impactful your app marketing campaigns are in moving that needle. Having the right data insights will allow you to strengthen your interactions with users, ultimately resulting in a positive uptick in retention. With the mobile takeover already in effect, it’s time for marketers to step up if you want to succeed. This means making retention a key performance indicator of a successful app, alongside acquisition and engagement. Now that you have a good benchmark for app user retention, it’s time to make a plan to improve. Consider making one of your 2018 mobile goals all about improving retention and reducing churn. You can achieve this by using the above tactics to carry out smart marketing campaigns. For reference, here is our mobile app benchmarks for H2 2017.